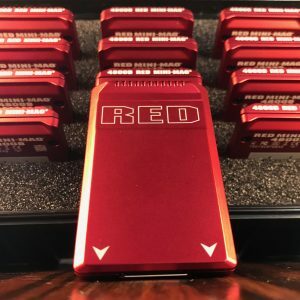 RED Mini-Mag Drives 480GB In Stock. $1850 with Free Shipping from Austin Texas. The RED Mini-Mag 480GB Drive is currently the most popular size Mini-Mag Drive with RED Camera Operators. SKU 750-0090 currently Sold Out at the RED Store. You’ll need one RED Station Mini-Mag USB 3.1 Reader SKU# 750-0084 to copy footage from your camera to your computer. The RED Station is available and in stock for $195 at Texas Media Systems.